With the growing global demand for protein comes a need for more efficient animal production. According to the USDA Economic Research Service, while feed prices have risen, the all-milk price has fallen from $18.20 per cwt in November 2017 to $15.30 in February 2018. This is represented in the graph below which compares the efficiency of dairy feed equal to 1 lb. of milk produced, which has steadily declined since last year. Due to the rising feed costs, quality ingredients are not the first choice. Instead, animals are fed with the cheapest and most abundant ingredients, however, nutritional quality can suffer. High-shear dry extruded and pressed (ExPress®) soymeal is a high-quality ingredient which can replace several protein and energy rich ingredients in the dairy ration. Hence by switching to ExPress® soymeal to replace other less quality ingredients, the feeding value improves, and hence, improving overall animal efficiency and production. In the dairy industry, ingredients with a large amount of by-pass protein are popular. By-pass nutrients escape the rumen and are intestinally digested to support milk production. By-pass protein can be utilized by the cow for milk production. Specialty by-pass products may provide a large amount of by-pass protein (60% – 70%), but the digestibility of these products varies a great deal. In other words, the amount of by-pass is not as important as the ability of the animal to utilize (i.e. digest) the by-pass protein for milk production as mentioned here. ExPress® soymeal, cooked by high-shear dry extrusion then mechanically pressed to lower residual oil, is a research proven source of highly digestible by-pass protein. 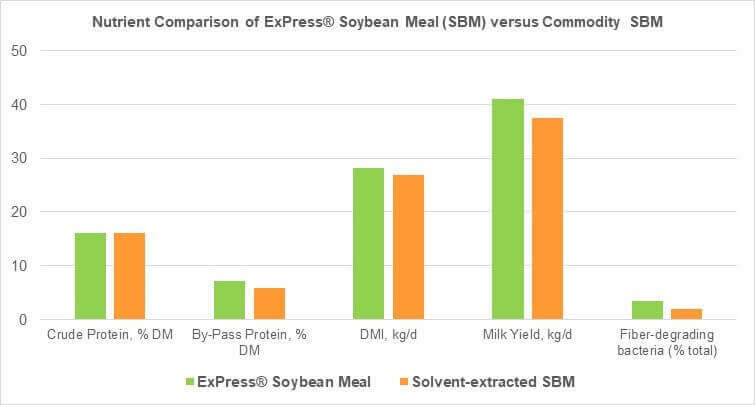 Shown in the graph above, ExPress® soybean meal by-pass protein levels are higher than solvent-extracted soybean meal. This led to the generation of by-pass protein soy-based meals which contain 60% – 65% (crude protein) by-pass protein. Express® soymeal is a source of highly digestible by-pass nutrients that support milk production. Described in this study, the cows fed ExPress® soymeal increased feed intake +2.1 lbs. and milk production +7.5 lbs. versus the cows fed hexane-extracted meal. Additionally, fiber utilization in the rumen was improved in ExPress® fed cows. In summary, ExPress® dairy diets have a higher inclusion rate with fewer ingredients which reduced feed costs. Taken together, ExPress® soymeal is a highly digestible source of protein and energy for dairy cows all while lowering feed costs when compared to by-pass protein meals and hexane-extracted soybean meal.